Various states have different procedures of obtaining the permit, however we have mentioned the following details with full accuracy so that you get a correct idea of proper communication with the respective zonal RTO's of the state. 1. You need to be a localite of the state which means individual should be residing in any part of the state for which he/she is applying for permit. In order to fill up the details, you need to visit the respective Regional Transport Office (RTO) and obtain a P.C.O.P.A application form which must be accompanied with the process. The process of online application form makes sure there is a convienancy for each applicant / individual according to his time. This made sure that transparency is maintained on an overall from the regional part of Transport coordination for each state. In the application form there are basic details which needs to be filled like - Full name and address according to photo and address proof details, vehicle number, RC passing number, age (date of birth) details and other certifications as mandatory part. Please make sure you are holding these details in prior to filling up the application form so that there is less back and forth involved in releasing / issuing of permit licence. 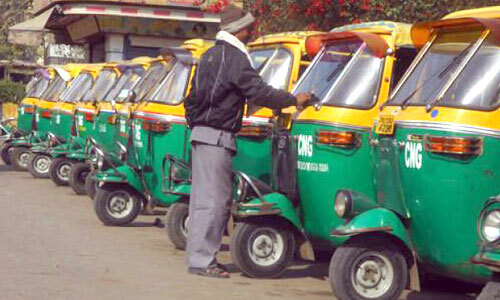 What is the application fees for issuance of Auto Rickshaw permit licence? The fees might be different for various states of India. However on a general note, Regional Transport office charge something around - Rs.350 to Rs.500 per permit issuance of the vehicle. An additional court stamp fees of Rs.10/- is required to be affixed with the application form. When is the Auto Rickshaw permit issued with validity period? Generally the permit licence is issued within the same day of application processing at the respective RTO office with the vehicle. The passing officer inspects your auto rickshaw which you need to bring at the RTO office with all other details and he then issues the permit licence to your name. The official document takes 2-3 days to receive at your residence address mentioned in the application form. The general validity period of each licence / permit is 5 years from the date of issue. After the validity, individuals need to re-issue / apply for renewal of licence which is a simple process. I want to know that any parmit issue by barasat motor vehicle of rote ultadanga to no 1 airport .. please tale me about..